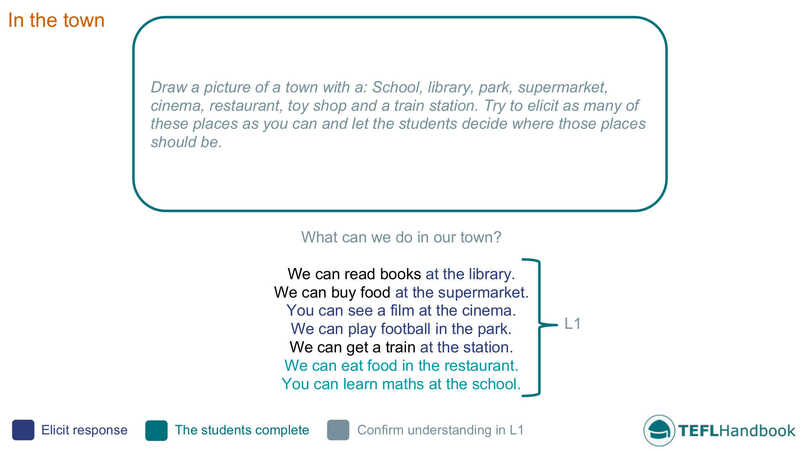 An ESL lesson plan for teaching places in the town to beginner level students (A1). Feel free to adapt these activities to your ESL lesson plans. If you use an iOS or Android device, don't forget that you can get offline access to these materials, along with a much more extensive selection of ESL lesson plans, through the TEFL Handbook app. Tell the students that they are going to help you to create a town and follow the instructions in the green box. The students should copy this into their notebooks. After that, add the question below the box and confirm that the students understand it. Finally, tell them that they are going to help you make sentences about the different activities that you can do in this town. Use mime to elicit examples for each place. Students have to mime activities related to different places in a town. One at a time, students come to the front of the class to perform an action associated with a particular location. The other students have to guess the place and the activity. You can turn this into a game if you want, and it also serves as an excellent revision activity for future classes. For this activity, the students are going to write about their hometown. Teacher: In my town, there’s a beautiful church. In this follow-on activity, students will present their work to the class. After completing the previous activity, students will now come to the front of the class to read their work. Here is one idea for a fun game that can be used to practice places in the town. As usual, our suggestions require the minimum of classroom resources and materials (whiteboard and markers). Students have to move into the correct position based on prepositional statements. Teacher: The church is next to the car park. The student in play then moves into position, aided by their teammates. Give a point a team if a student positions themselves correctly. There are a number of worksheets at iSLCollective that can be used to revise this topic. We like the Public facilities and Buildings crossword worksheets. Do the buildings worksheet as a group activity, adding the vocabulary to the board before they begin. If your class is equipped with internet and video, you can use this fantastic video from the English Singsing channel to introduce or revise places in town with kids. Our suggested next lesson focuses on expressing likes and dislikes. If you've found these materials useful, be sure to check out our full list of ESL lesson plans for beginners (A1 Mid-level), as well as our complete selection of EFL - ESL lesson plans. If you use an iOS or Android device, have a look at the TEFL Handbook app. An ESL lesson planner for English teachers. It has a lot more content and gives you faster access to our ESL resources, making it easier to use in class.